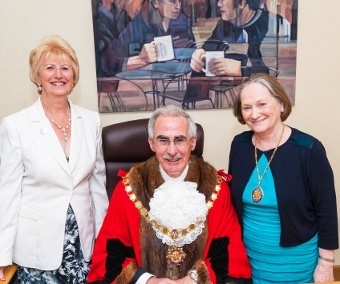 WOKING raised a salute to its new mayor on Thursday. Stepping into the red robes at the council’s Civic Offices late last week was Conservative Councillor for Horsell West, Tony Branagan. The former military man replaces Lib Dem Anne Roberts and becomes the borough’s 41st mayor. Having relished his role as deputy last year, Mayor Branagan said he is raring to go and ready to take on the starring role. After 22 years service as a member of the British Army, including spells in Germany, the Supreme Headquarters of Allied Powers Europe in Belgium, and Hong Kong, Cllr Branagan was elected as the Conservative member for Horsell West in 1999. Since becoming an elected member, Mayor Branagan has sat on the Planning Committee and says he enjoys taking an active role in the development of the town centre and the borough. He said: “Planning has an immediate and very lasting impact. It evokes tremendous passion and emotion in people which is why Planning Committee meetings are often packed. During his term, Mayor Branagan has decided to support three charities: Combat Stress, Crossroads Care Surrey, and The Young Carers at Woking High School. “It was a very difficult decision to decide which charities to support as there are so many providing such wonderful services,” he said. Mayor Branagan will be supported in his role by wife Mary, his son, daughter and four grandchildren. Woking’s Deputy Mayor this term will be Cllr Derek McCrum, currently a Lib Dem Councillor for Kingfield and Westfield. During the ceremony, long-standing Macebearer Ron Simms stepped down from his duties after 40 years to be replaced by Chris Rivett. Ron will continue as deputy ,conducting informal duties that include educating school children about the role and responsibilities of the Mayor of Woking.